The Potato is a starchy, tuberous crop from the nightshade or Solanaceae family. This group of plants has members that are edible while others are extremely poisonous. Potatoes are related to the Eggplant, Chile Pepper, Tomato, Tobacco and the deadly Nightshade or Belladonna. Potatoes are native to the Andes with origins in Peru and Bolivia and they spread to the rest of the world roughly four centuries ago. Following the Spanish Conquest of the Inca Empire, the Spanish introduced the Potato to Europe in the 16th century where it was slow to catch on. Today the potato is a vital part of the worlds food supply as it is the fourth largest food crop behind maize, wheat and rice. The largest producers of potatoes are the Peoples Republic of China followed by India, Russia and the Ukraine. The seasonality for potatoes is January to April and August to December. There are over 1,000 varieties of Potatoes. In the US, the most widely used varietal is the Russet Potato. Mainly grown in the Northwest, Russets are great for baking and mashing. The Shepody variety of the Russet may not sound familiar but chances are you have had it in the French fry form as they were specifically bred to fry. To learn more about Potato varieties click here. Also, for an abbreviated list check out this Huffington Post article "All the Potato Varieties You Need to Know About." During the 18th century, Potatoes were served as dessert, hot, salted and wrapped in a napkin. Thomas Jefferson gets the credit for introducing the French Fry to the American people as he served them in the White House. A hotly disputed topic, the actual origin of the French fry is not France but Belgium! Click here and here to read more fun facts about Potatoes. To learn more about Potatoes click here. The Potato is another crop that is safest for consumption when organic. The Environmental Working Group lists the potato as the 12th most pesticide laden produce. Conventionally grown potatoes have one of the highest pesticide contents of all fruits and vegetables. In 2006, the USDA found that all 81 % of Potatoes tested contained pesticides even after being washed and peeled! Michael Pollan in a interview about his books said "I visited an industrial potato farm in Idaho and saw how freely pesticides were used. The farmers had little patches of potatoes by their house that were organic. They couldn't eat their field potatoes out of the ground because they had so many systemic pesticides. They had to be stored for six months to off-gas the toxins." Potatoes should be kept in a cool, dry place with good air circulation. If you choose to store potatoes in a bag for more than a couple days make sure there is plenty of ventilation and that the bag isn't sealed. It is recommended to store potatoes separately from onions because when they are stored together they produce gases that will spoil them both. Fingerling potatoes can be refrigerated, other varieties should not be stored in the fridge. Use fingerlings as quickly as possible for the best flavor. For more tips on how to keep Potatoes for longer storage click here. 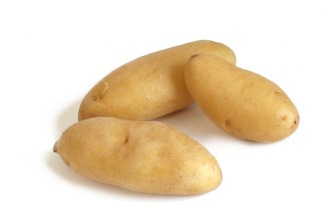 Potatoes are high in Vitamin B6, Potassium (they have more than bananas! ), Copper, Vitamin C and Manganese. If you take away the extra fat of deep frying and restrain from adding fatty foods like butter, sour cream and cheese to name a few; a baked Potato is a healthy low calorie and fiber rich food choice. Leave the potato skin on when cooking, it not only adds fiber and nutrients, but it also helps the flesh of the potato retain its nutrients. Potatoes have been proven to lower blood pressure. The Vitamin B6 in Potatoes contributes to building new red blood cells, maintaining nervous system activity, protecting the cardiovascular system and enhancing athletic performance. Click here to read more about the health benefits of Potatoes. Potatoes are extremely versatile as to cooking methods that apply. They can be boiled, sauteed, fried, roasted, grilled, mashed, pureed, baked and the list goes on. Click here and here for basic knife cuts that are taught in Culinary Schools and that will guide you in different ways to cut and use your Potatoes. Check out this Fine Cooking article to learn how to pick the best potato for your end use. Southern Food has some great tips on cooking Potatoes and check out this Huffington Post article on the best ways Potatoes can be prepared. Check out What's Cooking America for the perfect baked potato.